Kansas City Attractions Feature for December 2013. Join us THIS WEEKEND for the BLUE COLLAR RIOT ....... JAMES JOHANN!! "The Late Show with Craig Ferguson"
The international headquarters of Hallmark Cards. Crown Center offers something for everyone. The three level Crown Center Shops features 60+ shops & restaurants. Enjoy skywalks to Union Station & Westin Crown Center Hotels. <-- Check out our December 2013 Directory for Kansas City. Downloadable PDF highlights specials, savings and event at local businesses. First of all, a safe, joyous and peaceful holiday season to all! If you want your business featured (rates/info), call me at (913) 271-2955. 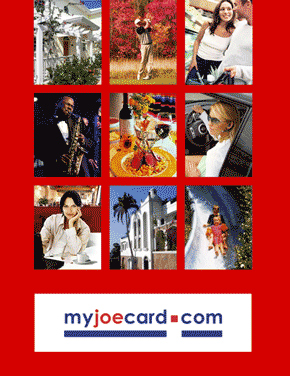 Deal of the Day: 12 MyJoeCards Delivered for $20 (Great Gifts!). Also have a great and Happy New Years! Stay Tuned, More great stuff on the way in 2014!